Darwin’s ideas about species, when put to the test, have run into seemingly insurmountable hurdles. The reason for his problems is that Darwin accepted false assumptions about earth history and he rejected the Creator’s role. Once we add God’s word to the equation, it opens a whole new world of possibilities for understanding how species form within God’s created kinds. Ugly? Tasty? It’s a matter of opinion. But one thing we know for certain about the marine iguanas of the Galápagos Islands—they aren’t fishing for fish. They’re actually grazing underwater on marine algae, and no other lizards in the world can do that. Young marine iguanas feed exclusively on the algae exposed at low tide, while some adults can graze underwater for up to thirty minutes. Their black color easily distinguishes the marine iguanas from the tannish brown land iguanas that also live in the islands (see photos below). How did these amazing marine iguanas come to be? 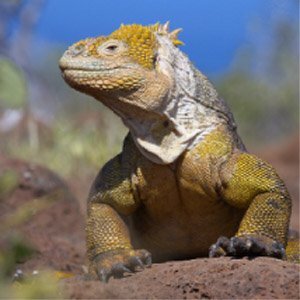 The natural theologians of Darwin’s day might claim that God created these iguanas with just the right attributes to live in the Galápagos Islands and eat algae, demonstrating God’s power and wisdom. As creationists, we might be tempted to agree and give God due credit for His “marine iguana” design. But wait a minute—what if the marine iguanas belong to the same created kind as the land iguanas, both descendants of the original iguanas that God created on Day Six? And what if the marine iguana were the only swimming grazer in this created kind? What would that mean for our understanding of God’s design of marine iguanas? Iguanas are fairly easy to identify no matter where found in the world because they share the same basic body traits. The similar anatomy indicates that they descended from one original created kind. So what does “design” mean in a world where God created kinds in the beginning, but new species, such as the marine iguana, appeared later from those original kinds? In other words, how could new species be so well adapted to their new environments unless God made them directly with His own hands? One way to answer this question is to assume that God specifically designed the created kinds with genes that could be turned on to help them adapt to new environments. 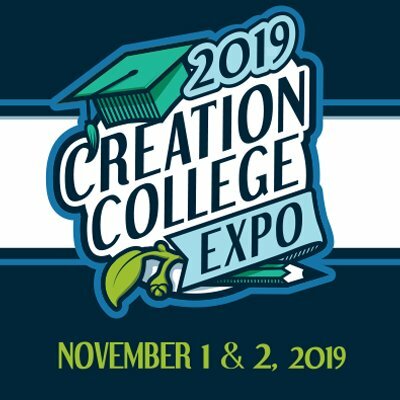 In other words, the Creator continues to accomplish His purpose for organisms after creation, not by creating something new, but by working through existing parts that were designed during Creation Week. An analogy is the manufacturer of a fully equipped Swiss army knife, who stores within the knife every tool a camper might need as he faces the unknown challenges of wilderness living. This idea—that changes in God’s created kinds arose because of designed adaptive variations—is called mediated design. It’s still “design” because God made those traits and gave them to His creatures to use, but God used special events or other conditions to bring out the design. Mediated design may help explain variation within created kinds, and it can account for the unbelievable complexity of systems like the photosynthetic pathways (they were designed) and how so many different plant kinds have the same systems as Flaveria (one Creator made them all). How does the Swiss army knife analogy apply to marine iguanas? The interesting thing about marine iguanas is that their adaptations aren’t really that amazingly different from the physical characteristics of land iguanas. Marine iguanas have special physical traits to help them conserve body heat (a handy tool in the cold Galápagos waters), but all other iguanas have similar, though less developed, traits. They have “salt glands,” which help them get rid of excess salt that they get from swallowing ocean water, but once again, all lizards have salt glands. 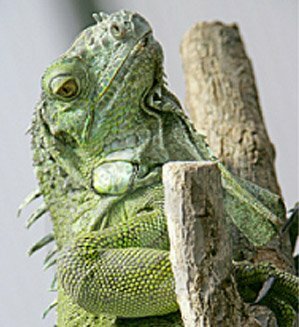 Their tails are flattened, which helps in swimming, but other iguanas that don’t swim have flattened tails. So other iguanas have the same traits that marine iguanas use for underwater grazing, but the traits are less developed in other iguanas. That sounds like mediated design. 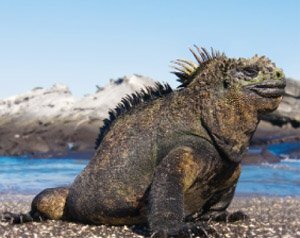 Somehow (and we don’t know exactly how), God made it possible for these traits to become strongly expressed in marine iguanas, and they took to the oceans to find their food. The variation within each of God’s created kinds is truly astonishing. Iguanas are just one example. Consider another example—cats. In addition to all the big cats that filled the earth after the Flood and then went extinct (such as the saber-toothed cat), forty species of cats survive. Living species display incredible adaptations that enable them to thrive in varied environments, whether a lynx in frigid Siberia or a black jaguar in the Amazon rainforest. Just as amazing are the domestic cats. Breeders have discovered nearly one-hundred breeds so far, each with its own distinct personality and delightful traits. Yet all are cats—big or small, striped or spotted, all appear to have descended from the original parents who survived the Flood on Noah’s Ark.1 We know they descended from one kind because wild cats can hybridize (produce young) with other wild cats as well as domestic cats. How can we explain all this variation and extraordinary adaptation? One possibility, consistent with the truths of God’s Word, is mediated design—the belief that God specifically designed each created kind with genes that could be turned on by environmental factors to help them adapt to new surroundings. 1 See D. A. Robinson and D. P. Cavanaugh, “Evidence for a Holobaraminic Origin of the Cats,” Creation Research Society Quarterly 35 (1998): 2–14. If the mediated design model is correct, then we should be able to test it and even reap major benefits for mankind—discovering new variations of plants that produce better food, new ways to fight disease, and so on. Imagine if we could access more of these amazing traits that God designed. Imagine if we could make better crops or livestock or medicines naturally—without the kind of genetic tinkering we use now. After the Flood, how did God quickly fill the earth with such an amazing variety of species? One proposal is mediated design—God designed adaptive variations within the original created kinds. But more research needs to be done. How could we do this? Many of the adaptations that were built into the original created kinds likely appeared right after the Flood, while others may never have been expressed at all. If so, some designs may be just waiting to be revealed at some point in the future. Perhaps there’s a clue to the trigger in the conditions after the Flood: a unique period of extreme and unpredictable stress. If we could reproduce similar stressful conditions, perhaps we could get some hidden designs to appear. This is not an ad hoc approach to understanding the mechanism behind speciation. We can compare the genetics behind photosynthetic pathways, salt gland development, or even the humps that appear on camels but not their cousins in the same kind, the llamas. We can then test possible mechanisms to see how these traits are expressed. Thus, the simple model of mediated design could open a whole new research program, opening up brand-new avenues of investigation that aren’t even being considered within the prevailing “random variation” worldview. Creationists in Darwin’s day were asleep, lulled into a false sense of security by the unbiblical claims of natural theology and “species fixity” (see “Do Species Change?” p. 36). The Origin of Species changed all that, and the sleeping giant of the creationist community woke up. 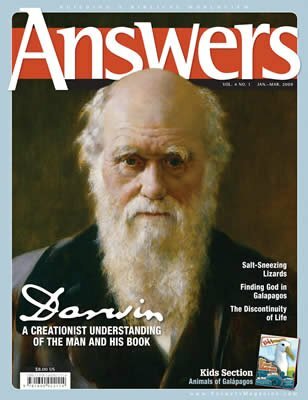 Though we don’t have all of the answers, even 150 years later, creationists have made a lot of progress. It is an exciting time to be a creation scientist. As secular scientists discover more data about our world and intensify their challenges against the Creator, we are forced to study the Word of God in greater depth and examine our world more closely. The “trials” allow us to discover more truths about God, magnifying His glory and wisdom. Robert Fitz-Roy, Proceedings of the Second Expedition, 1831–1836, vol. 2 of Narrative of the Surveying Voyages of His Majesty’s Ships Adventure and Beagle (London: J. L. Cox and Sons, 1839), p. 486. J. R. Slevin, “The Galápagos Islands: A History of Their Exploration,” Occasional Papers of the California Academy of Sciences 25 (1959): 1–150. James Colnett, Voyage to the South Atlantic and Round Cape Horn into the Pacific Ocean (London, 1798), p. 158. Todd Charles Wood, “A Creationist Review and Preliminary Analysis of the History, Geology, Climate, and Biology of the Galápagos Islands,” CORE Issues in Creation 1 (2005): 1–241. Todd Charles Wood and David P. Cavanaugh, “A Baraminological Analysis of Subtribe Flaveriinae (Asteraceae) and the Origin of Biological Complexity,” Origins (GRI) 52 (2001): 7–27. William R. Dawson, George A. Bartholomew, and Albert F. Bennett, “A Reappraisal of the Aquatic Specializations of the Galápagos Marine Iguana (Amblyrhynchus cristatus),” Evolution 31:891–897.